Andre Chaperon is well-known as a master of email marketing and autoresponders, and in this 3-part podcast series he is sharing the principles and strategies that drive his success. Tune in to this first episode as he discusses the first step to effective email marketing: goals. 02:41 – Doing it just for the money? 07:01 – Why should people pay attention to you? 13:51 – What can you promise? James: James Schramko here. Welcome back to SuperFastBusiness.com. Super awesome. 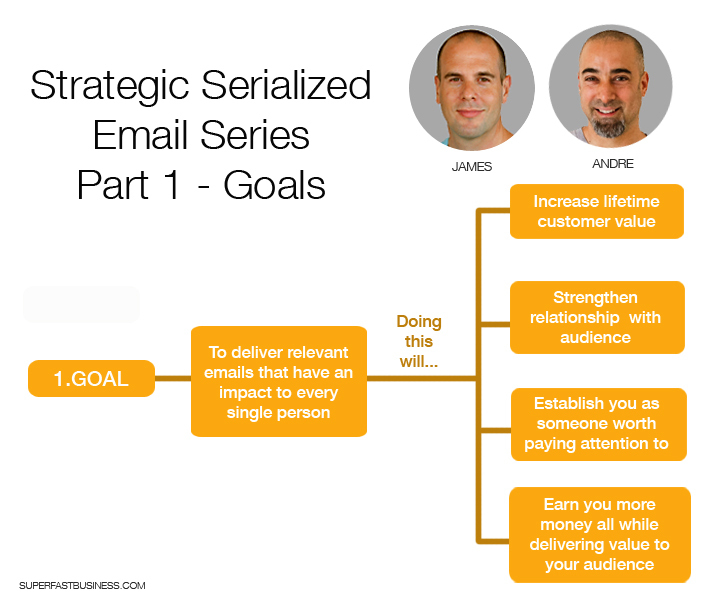 Excited today because we’re going to be covering some strategic serialized email series information with my good buddy, Andre Chaperon. Welcome to the call. James: Many years ago, I invited you to a podcast and you said no because you don’t do podcasts. You’re very shy. What happened in between then and now? Andre: Yeah, I just put myself on the line and now, I say yes every now and then. I still say no more than I say yes. James: Well I feel extremely privileged and our listener is in for a treat because you’ve put together a whole series at my request. I’ve said, “Andre, we’d need to bring this stuff you’re doing to a broader market.” We’ve got a great platform to do this with podcasting. We speak to each other every week. I’m so excited about what you do in your business and the great results you get. You’ve got worldwide fame as the Autoresponder Madness guy, and that is a big accolade. You’re pretty much the industry standard, the benchmark of which everyone else has measured for emails and autoresponders. So let’s just talk about this series. We’ve sort of given a little overview of why we decided to do this. But what are we actually going to be talking about in this series? We’re going to break this down into three modules. The first episode, which is this episode, we’re going to talking about the goal of your emails in general. We’d talk about why it’s good to do emails, what exactly are we talking about and some basic stuff. And then in episode two, we’re going to break into the strategy. We’re really going to dig into the sub-levels of some of the really cool stuff that you’ve discovered in the many years that you’ve been doing this at an elite level. And then we’ll come back for episode three and talk about some tactics because everyone wants to know the tactics. After we’ve covered strategy, that will be an appropriate time to get some of those little subtle distinctions that are going to tweak and tune your overall strategic approach with some of those tactics. If you combine all of that, what you have is the strategic serialized email series. So Andre, are you ready? Andre: Yeah, let’s go for it man. This is good. James: All right. So we’re going to be talking about the goal of your email within your business. I know you’ve talked about the serialized aspect and perhaps we should develop what that actually means. Andre: OK. So, should I start with the goal then? James: Yeah, start with the goal. What are we actually trying to achieve? Why is this even important? Andre: OK. So my idea of the goal of what email is about may be different to you and somebody else’s, and I’m pretty sure if I asked a hundred different marketers, “What’s the goal of you doing email marketing?” we’d probably get a huge different array of reasons. I’m probably going to come across slightly as an ***hole for saying this one thing, but I’m going to say it anyway, and that is I think there are many marketers that they use email because they want to earn more money. And again, there’s nothing wrong with wanting to earn more money. But they rig email marketing in their favor, so their goal is purely transactional commodity-based channel that they use to make more money. And having that mindset and mentality, everything that they do is rigged in their favor and might earn the favor of the recipient, the customer, the prospect or the person on the other side receiving those emails. So I guess that’s the first thing I would say. For me, the goal, although it’s obviously to earn money, primarily it’s about deepening the relationship with my audience that then allows me to have other core things/benefits locked and increase customer value because now they want to stick around, and they want to hear what I have to say, and they’re not going to get frightened the way like Bambi, I don’t know. So yeah, it’s about strengthening their relationship with their audience that you care about helping and they want to receive these emails from you. So I guess that would be my number one goal. And as a result of executing on their goal, you earn more money. James: Right. I was going to say that isn’t it, it’s still going to earn you plenty of money if you have a relationship and people stick around, certainly if they do, and you asked them from time to time, they would actually purchase something. So you’re really just talking about having a longer-term approach to email than just instant gratification method. Andre: Yeah. It’s funny sometimes because I do the odd consults with clients, and I get approached and someone will say, “I’ve been hammering my email list to sh** for the last few years and it’s made me a ton of money, but my open rates have dropped to near about zero and I have a huge list.” So it’s like at that point, they’re already thinking, you know maybe it’s a good idea to think about this whole relationship thing with the list, hence why they want to jump on the phone with me. So I think that’s the better approach is to start off by rigging everything in the favor of your audience and then you get to have this asset that’s going to be around for a long time, and you’re still going to make a whole bunch of money. James: Well this is crazy talk. So you actually care about your customer. Andre: I know it’s insane, isn’t it? James: You hear people talk about it, like the ability to send email really is just like pushing a button to inject cash into your bank account. And then we hear about, your people seem to reflect on their lists down to more of a, that’s all presumed so now it’s just that we’re going to hammer our list every day or should we just do it every week? And if people want to leave our list, should we be upset about that or not? The volume that some people send is astronomical. Sometimes, you might get several emails per day from a marketer. And then other times, you never, ever hear from them, but when you do hear from them, they blow you away because their emails are so rare that they’re scarce. But they probably are missing out on the relationship, too. So I’m sure we’ll cover some of these more specifically in the strategy and tactics section. So how do you establish yourself as someone worth paying attention to with your email series? Andre: Well for me it all boils down to one thing and that’s relevancy. Be relevant. So every single thing that I do, I’m thinking about that one thing. And whatever I do needs to fit into that box. It can’t violate that thing about being relevant. So as soon as you think about relevancy like that, it completely eliminates certain behaviors that lots of other people just take for granted and that’s how they operate. So yeah, relevancy is different for everybody because obviously, we’re all different and unique. So I guess the way that I look at it is somebody comes into your sphere of influence for example, they’ll land on one of your websites, they’ll read something on that website, and something will drive them to add themselves to your email list. So how that works obviously looks different for everybody that for whatever reason, they end up on your email list. Now at that point, they’re there for a reason. It’s typically for whatever they’ve just read on your site, whether it’s some sort of bribe or moneymaking tool, whatever. Now that person is going to go through a shift overtime. They’re going to learn some stuff and they’re going to read some stuff and lots of stuff, and at some point, that person is going to have a certain need that’s going to be slightly different to the reason why they first jumped on in the first place. So I guess, an example would be, if it’s a traffic-based thing and they’ve jumped on to someone’s list because they’re interested in acquiring more leads and traffic. So obviously, there’s different channels to traffic, and there’s SEO as you know about, and there’s PPC, and there’s paid traffic, and there’s various forms of organic and social traffic. There’s all these different components, and it can be assumed that no one person is going to be interested in all of those things at the same time. So by being relevant, you can’t just send the same type of emails to the whole bunch of people and then just hope that it’s a good match. You can maybe email one, two and three because you know the reason why they’re there, but as soon as it goes out a few weeks, a few months, how do you know how that person has evolved and their level of sophistication has obviously changed? So there’s obviously ways to figure this out that being relevant is understanding that there’s this change happening and you need to be aware and rig your system in such a way that it allows people to self select and therefore, get the right message at the right time, sent to the right person obviously. Making sense? James: Yeah. So you’ve touched on a few things there. You briefly touched on the promise, so whatever has caused them to get on your email list. We might be able to develop that in a second. Putting that aside, you’ve talked about the source. It’s where they came onto your list. It might be a different page, might be as a prospect, it might be as a buyer. And then you’ve implied that there’s an arc that they’ll go through that change. Would it be fair to say that some of the way that your goal of keeping that customer value and relationship there is that you’re actually creating some of that arc through a deliberate email strategy? Andre: Yes. You need to have a deep understanding about your audience and why they’re there, what motivates them, and ultimately, what their desired outcome is. So there’s a few things that are presumed, and you can’t operate on a very surface level. You need to have a deeper understanding; otherwise, whatever you send out, it’s not going to be deep enough for it to create a connection with somebody. James: So based on that, if you’re talking about segmenting and having the ability to detect where someone is at and being able to change things and have your system set up for that, it sounds like you’re needing some level of complexity to your email system beyond just the standard everyone goes on a house list and hit them over the head every day with the same list. Andre: Yeah. Back in the day, few years ago, it was obviously more challenging to rig the system like this. I was using Aweber at the time, which is probably the most basic level of sophistication in the industry and they’ve remained that way almost since the beginning of time. So they’re one company that just hasn’t evolved, but even if you do use Aweber, you can still rig this, it’s just slightly more challenging, but it’s not rocket science. But yeah, any new ESP that you use, the whole range of them, from the good, the bad and the ugly, they all have this pretty much baked into their DNA, whereas you can easily create this automation required to be able to do all of this stuff. James: Right. So I have to hit the buzzword buzzer here. ESP stands for? Andre: Email Service Provider. So your Awebers and Infusionsofts and Active Campaigns. James: Yeah. Just don’t want to make it easy for anyone to follow this. So, so far, just a quick recap, what you’re telling us is that a good goal for your email is to increase the lifetime value of your clients and customers by strengthening that relationship, making sure that they want to pay attention to what you’ve got to say, and that one of the keys to that is to recognize that some people change from when they join your list to where they end up, that you’ve got to consider where they’re coming on to your list, and you also have to observe as they go through that change. Whether you’re creating that change or whether they are naturally going through it, there will be some technology that helps you to keep segmenting customers into the appropriate part of your email system, your ESP, so that you can have the right conversation with people at the right time. Is that about right? Andre: It’s about right. And all of that can be summed up into one word, which is relevancy or being relevant. James: Beautiful. Let’s just come back to… I promised to talk about promise. What sort of things do you use as your promise to invite people into your email database? Andre: Yeah. Again, I approach this part of the whole system very differently than everybody else. I don’t want to freak people out by creating more questions in their mind than answers, but essentially, somebody obviously comes to our website, they’ve got some sort of goal, there’s a problem that they need solving so they end up on our website, and they could have been there from just doing a search on search engines, or clicking on an ad somewhere, or being referred to by somebody else that they perhaps know and trust. So all of those create a different levels of… when they land on that site, they’re either cold or they’re warm, or they’re piping hot, depending on how they got there; if it’s been referred by somebody they know and trust. James: Well, someone’s listening to this podcast, they get to the end, and then they go and click on Autoresponder Madness link, that’ll be in our show notes, they’re going to know all about you. Andre: Yes. So their form of references is going to be different to somebody that perhaps clicks on their Facebook ad, and that’s never heard of me, but the ad just kind of popped out at them, so they click that. James: Does that mean you’re sending them to different places? Or do you have different types of offers in the same place? Andre: Again, it goes down to relevancy. So you know, I guess in some cases, you can have all your traffic going to one place, or you can get all ninja and slice and dice the traffic to go to different places. So cold traffic would go to a place that perhaps introduces them to you in a different way than if somebody would just land it up on your website for example. So my main website, when you go to it, it presumes a few things and it’s a good balance for people that may have heard of me. So the people listening to this now that perhaps may click the link and go across to my site, it’ll all make sense when they get there. That’s hard to rig up, but when I’m driving cold call traffic, then there’ll be some sort of bridge page that happens just before they end up on that home page that perhaps tells a slightly different story that just introduces them to me very quickly. But yeah, then there’s obviously a promise on the website, and people will opt-in to get that tool. James: Exactly. So just some simple application I might share to make this simple is if you have a business type of website, you might have an About page, and the About page might have content that helps people get to know you and you might have an opt-in invitation that is different than you would have in category-themed content that’s more technical, or deeper, or warmer in nature. So on my site for example, we have different calls to action depending on the category of the content, and we divided our content into the three main categories of our business units, and that will end up in different calls to action so that people go to the right place and they get on the right list. And then you can start combining behavioral things too, can’t you? So for example, a site like mine where we’ve had information products, and also services, we’ll actually start sending different emails if people visit a checkout page for different products. We’ll actually follow them up specifically for the product that they visited. When we’re doing that, we can actually hold them out of all other communications if we want to focus just on that transaction. So these are some of the things I think we’re going to raise down in the strategy and the tactics section. Andre, what else is there to talk about regarding goals before go on to our next module? Andre: I think that about nails it. The goal is to be relevant and you rig up your system so that it delivers this awesomeness to the people reading your stuff. And if you do that well, you’re going to get rewarded by not just earning more money, but you’re going to get that increased customer lifetime value, which is awesome, because now you get to make more money from that one person over time than somebody else that may burn that person to death, and within the first seven emails, that person’s never going to open up anything else ever again. So you’ve just lost that opportunity to earn money from that person ever again. So yeah. Be relevant. James: Perfect. So the quote for this episode is rig your system for relevancy. Andre, I’ll catch up with you on the next episode. We’ll be talking about strategy, and we’re going to go deep into that. Are you ready? Andre: Oh, my favorite part.